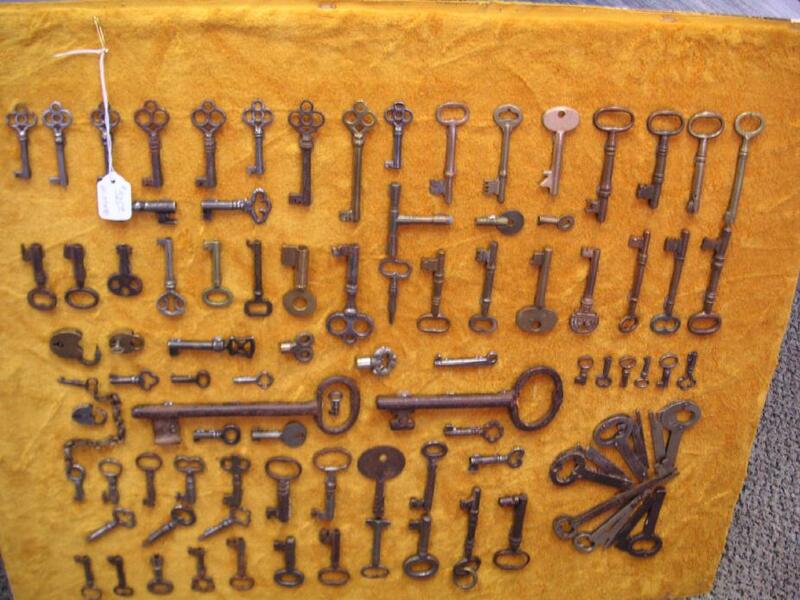 Antique Skeleton Key Lot. Estate fresh. 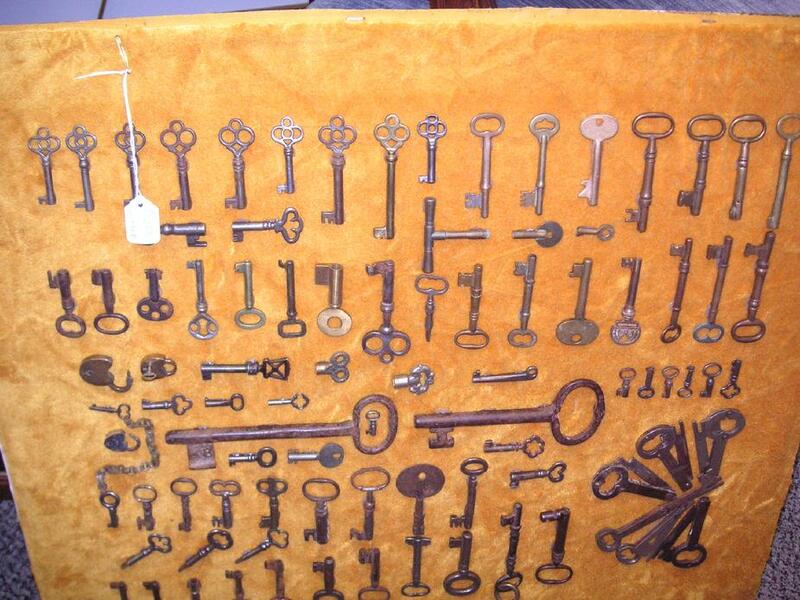 Antique and collectable keys for doors, cabinets, etc. 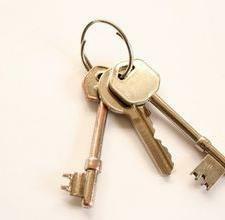 Stop in we have old keys for sale! The Piano Sonata in F major by Wolfgang Amadeus Mozart, K. 332/300k, was written at the same time as the Piano Sonata, K. 330 and Piano Sonata, K. 331 (Alla turca), Mozart numbering them as a set from one to three. They were once believed to have been written in the late 1770s in Paris, but it is now thought more likely that they date from 1783. Vienna has been suggested as a possible place of composition, with others believing the sonatas were written during a visit to Salzburg where Mozart introduced his wife, Constanze, to his father, Leopold. All three sonatas were published in Vienna in 1784. Clay tablets from the ancient Babylonian Empire, almost 4,000 years ago, depict keys. Greek woman with bronze key on her shoulder. The Greek word kleis is the root of the French clef. 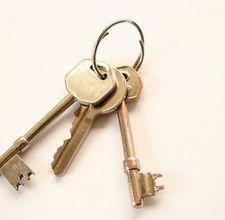 In Ancient Greece, keys were used for temple locks and Spartan locks. Women carried the angular bronze keys on one shoulder. One literary source, Homer, speaks of the key to Odysseus�s storeroom. The Greeks are said to have invented the keyhole, while the Romans refined it. Angled bronze key from the Artemis Hemera temple in Lusoi, Arcadia. The inscription confirms that it is a temple key. Length 40.5 cm. 5th century BC. The original is at the Museum of Fine Arts in Boston. Early Roman keys possessed technical finesse and elegance. They were primarily status symbols for those who had property to protect. Some keys also reflect the architecture of the day, made not only to fit into a lock, but also to look like the door the lock is in. 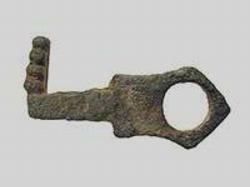 Roman key of bronze, circa 3rd C AD. Roman key finger ring of bronze. Archaeologists have found many bronze and iron keys in Saalburg, the citadel at the Roman Limes, built to hold off the barbarian invasions. Today Saalburg is a museum 30 km north of Frankfurt am Main in Germany. 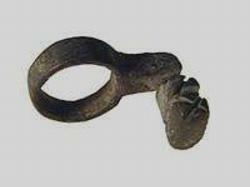 Another Roman innovation is the tiny key included in a finger ring. Women used keys like this for their jewelry boxes. European keys in the 6th�9th centuries generally reflect the dominant styles of the era, which makes it relatively easy to determine their age even without access to their locks. 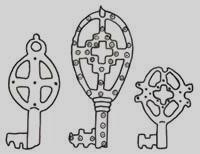 Merovingian keys (about 500-750) are more rough-hewn than their predecessors, revealing a regression in craftsmanship. Carolingian keys (about 750-960) usually have a bow shaped like a cross, a bishop�s miter, or other religious symbols. 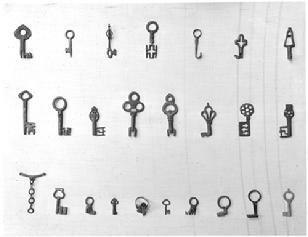 Keys, 1st - 7th century, provincial Roman. Bronze. wow!! 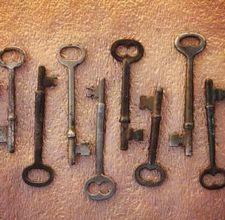 UP FOR GRABS IS THIS AWESOME LOT OF 90 OLD ANTIQUE SKELETON KEYS. YOU ARE GETTING THE WHOLE LOT. THERE IS AN ASSORTMENT OF DIFFERENT KEYS HERE. FURNITURE BRASS CABINET CLOCK BARREL PLUS MORE. Our special offer $260.00 <?xml:namespace prefix = o ns = "urn:schemas-microsoft-com:office:office" /> Please look at all my pictures for details and feel free to email me at floydruggles@weststpaulantiques.com with any questions. Please buy with confidence, I have traded in quality Antiques and Collectibles since 1997. Please know that your item will be properly secured for Pick up or shipping. Estimated Packed weight: 12 lbs 2 oz.